​Forget the fear and find the fascination of this tiny engineer at work! Students can do a close read of this Minute, searching for the sections that answer the who, what, where, when, why and how of spider webs. Have them deconstruct the Minute, looking for the answers to each question, and also the placement of those answers within the Minute. Which question was answered first? Last? Which question gets the most focus? Play with the order - mix it up and see if the Minute still works. Analyze how Author Pringle skillfully answers each question without resorting to a Q & A format! COmpare it to other Minutes and look at the similarities and differences. Finally, have students test one of their own pieces of informative writing to see if, and how, they addressed these questions! Revise, and repeat. Take a closer look at the spider web. Have students check out some additional videos on spider-building. A quick Google produces multitudes - check out this short piece at Smithsonian. Now challenge your students to form teams to design and build their own webs. What materials will they choose? What works best? What else will they need? How will they test it for strength? What kinds of adjustments and changes will they make along the way? Spiders exist everywhere. They live all around us, yet we barely notice. Have students start collecting evidence of spiders in their daily travels. Where do they see them? How often do they find the spider with the web? Are webs more likely to appear in some locations than in others? How many different types of spiders can the find?What other data can they collect to learn more? The spider is a pretty fascinating creature. Have your students brainstorm all the things about spiders that might inspire human behavior and invention. 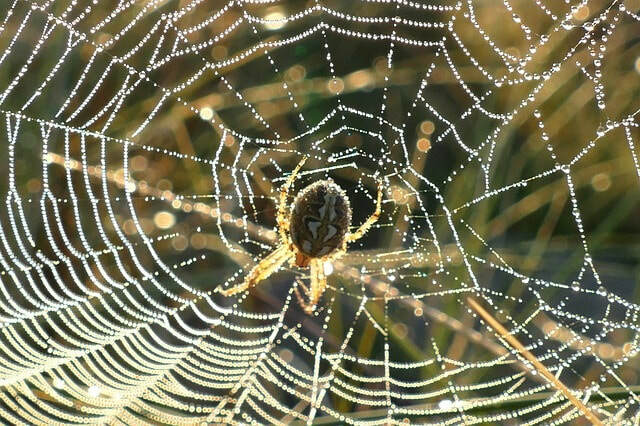 From design (do an image search for architecture inspired by spider webs), to synthetic materials inspired by spider silk and sensing devices inspired by spider behavior, biomimicry is easy when it comes to the spider!